Geometry has never tasted so good. Among the most reviled foods, spinach ranks somewhere in the top tier—for younger people, at least. Query a bunch of random teenagers on the street and most of them will probably name this leafy green vegetable as their least favorite – hot on the heels of Brussels sprouts, of course, which is by far the worst offender, according to popular opinion. As an avid hobby cook, much like me, you may have already realized that the way food tastes is largely influenced by its method of preparation. How to solve the spinach quandary then? Just throw in some cheese and hide it all under a blanket of fluffy dough. 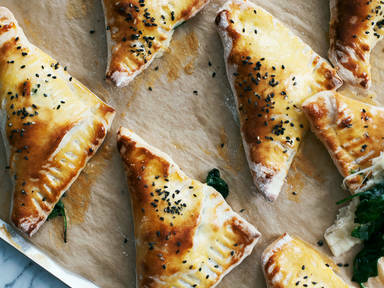 Your kids will love our cheese and spinach triangles and might even ask to take them to school the next day. No kids at home? They’re fantastic for lunch or as a quick and easy dinner. Watch the video for the full recipe and try it out yourself!